The bushing replacement kit includes components for reaming out a bushing passage in a mechanical structure, and for installing a new bushing in the passage. The reamer portion of the kit includes a reamer guide, which is secured precisely and immovably to the seal sleeve of the passage, the reamer having a pilot shaft that fits precisely within the guide. The guide is held in place by a guide retaining plate, which is clamped to the mechanical structure over the guide. When the reaming operation has been completed, the ream is removed and a threaded bushing installation shaft is passed through the guide and bushing passage. A new bushing is placed at the back of the passage, with a bushing installer placed in back of the bushing. A threaded fastener is installed on the installation shaft and tightened to force the new bushing into its passage. This 20 year patent is for sale but will consider licensing. 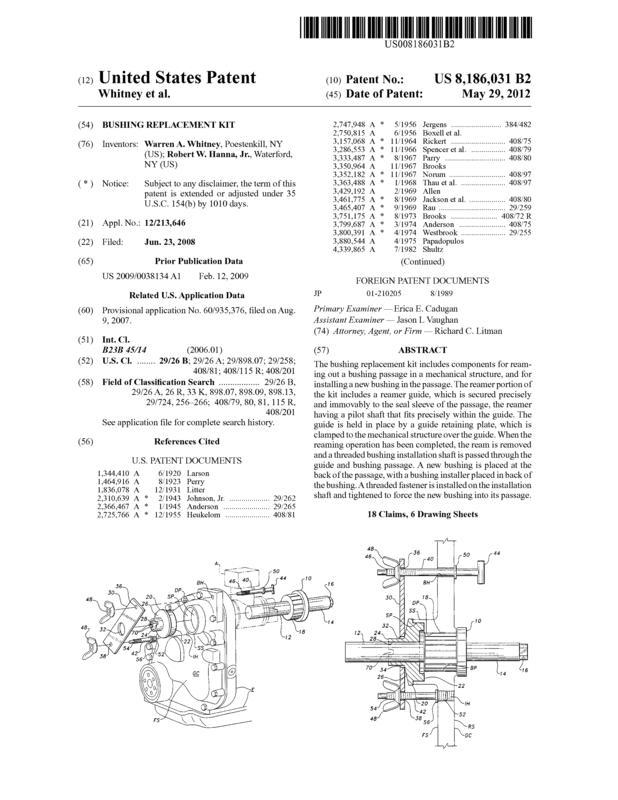 This patent includes both a tool and method that can be sized to meet other mechanical structure repairs. The financial gain is to repair the bushing bore instead of replacement, thus saving replacement cost and/or down time for your equipment. With that being said, there is the value of the tool and/or method. Page created at 2019-04-25 20:01:15, Patent Auction Time.